Acebeam extends the K40-serie with the K40S. A thrower, equipped with a Cree XP-L Hi LED that has a maximum output of 1.500 lumen with which the flash light achieves a throw distance of incredible 1.030m. The flash light is switched on/off by a rubberised button in the back end. The switch is a so called “forward clicky”. Halfway pressed it allows a momentary light, useful also for Morse signals. 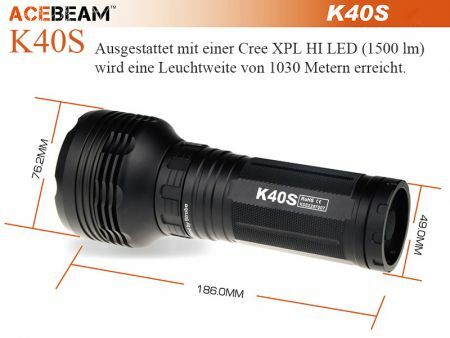 It is embedded so far in the end, that the flash light is tailstand capable. The six light levels and the strobe mode are chosen by a ring right behind the head that can easily be handled one-handed. 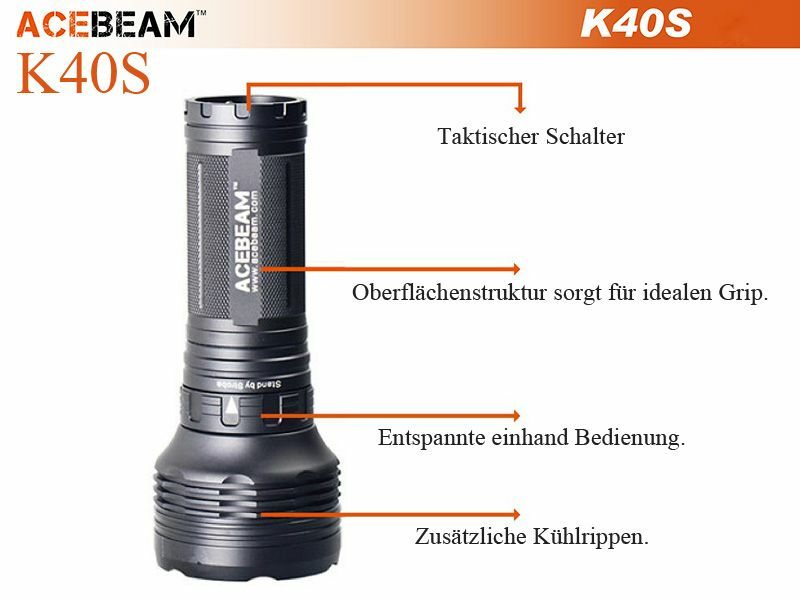 As is usual with Acebeam, the construction of the K40S is convincing. 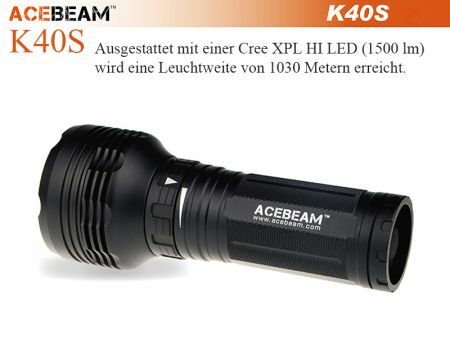 Due to the structure of the surface the flash light offers a safe and comfortable grip. 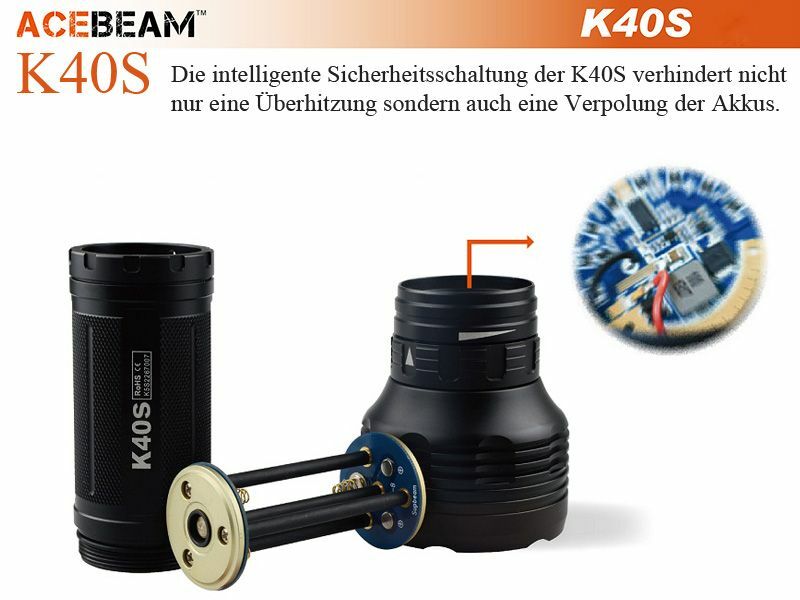 The robust design is waterproof according to IPX8 standard up to 2m and the intelligent circuit board design protects the lamp not only against overheating, but also ensures a maximum lifetime of the batteries. This Product was added to our catalogue on Thursday 07 January, 2016.